Murmurings of an Acer Aspire packing Intel's new Pine Trail N450 processor have been doing the rounds for a while, but finally pics and more specs have been leaked, cementing the existence of this still-unofficial model. 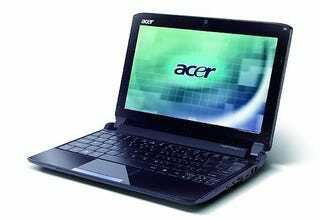 It's a 10.1-inch model with a 1024 x 600 resolution display, and runs on the aforementioned processor, along with an Intel GMA 3150 graphics card, 1GB of RAM, and has either a 160GB or 250GB HDD. A 0.3-megapixel webcam, 5-in-1 card reader, 3 x USB ports, VGA out port and audio jacks round it off, as does the Windows 7 Starter edition OS.